It's nothing major, but for me it's progress. I had my quickest ride up to Caribou of the fall this morning, and that's a good harbinger with ski season right around the corner. I'm not completely sure how well just riding a singlespeed uphill prepares you for ski season, but I'm about to find out. The good news is that when I do go into the weight room – about once every two weeks – I feel stronger each time. Went to see the Teton Gravity film "Light the Wick" last night at the Boulder Theater with Elaine. Lots of rock 'em, sock 'em fast skiing down insane lines, but some cool stuff too – a segment from Croatia, super deep snow at Jackson Hole and a part filmed entirely in 3D. I've never seen a 3D film in my life and came away impressed. One major complaint that Elaine and I shared: the film had basically no women skiers. I understand the market for these films is limited, but come on, there are plenty of girl skiers who shred and are worthy of being in this and any ski film. Elaine and I had a good brainstorming session for Nanowrimo – National November Writing Month – yesterday on a hike around Mud Lake. The goal is to write a 50,000 word novel in a month, and we're both taking on the challenge. Elaine is a superstar at this – she's completed it three times to my meager one. She's a better novel//fiction writer than me hands down. Nevertheless, I'm psyched for my novel, however much of a hack job it may be. I can't devulge details other than revenge for the Mudfest will be complete, Barker Reservoir will be drained flooding the justice center and there will be some wicked chase scenes in the high mountains on skis. Sort of a "Monkey Wrench Gang" meets crazy ski bum, only worse! 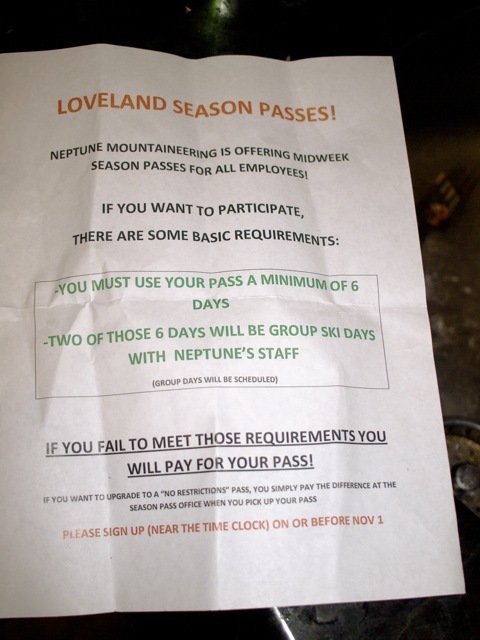 The place I work is providing free weekday ski passes at Loveland to all employees (note the somewhat comical office memo – love the parameters…you "must" ski…uh, ok, I think I can handle that. Hell of a lot better than the ones we used to get when I taught school! ), so it was an easy decision to pick up an extra one for Elaine yesterday as well for cheap. It comes with three free days at Monarch and Durango and one at Silverton Mountain, That will be definitely be a nice supplement to Eldora and the backcountry, and should extend the season out another month (or more) on both ends and allow us to explore some new (for us) terrain. They are blowing snow as we speak at Loveland, and I would not be shocked if they opened next week sometime.